Have no clue on how to make cross-functional flowchart? Don't worry, here is your way out! A group of well-created cross-functional flowchart examples are selected here, in order to give users a clear idea on how to make professional cross-functional flowcharts. 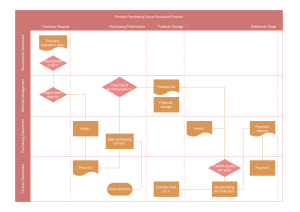 Download an example cross-functional flowchart template and learn ways to create your own. Cross-functional flowchart is very useful when you want to diagram a process and make it clear who is responsible for each step. Here on this page, we've carefully assembled some quality cross-functional flowcharts which are in fully vector format. Through Edraw Max, all the templates can be easily customized, just download and add pre-drawn shapes, connect shapes with smart connectors, add own texts, adjust the layout, and change color and line styles. Besides, a group of nice themes help apply a fresh and professionally designed look in just one or two clicks. You will find it amazingly fast and convenient in making presentation-quality flowchart through this user friendly tool. To learn more about how to make cross-functional flowchart, please read Basic Steps of Creating Cross-Functional Chart. When it's done, you can easily print or export the diagrams to PDF, Microsoft word, excel, ppt formats, or save them as images. Click here to see how to print and export cross-functional flowchart files. 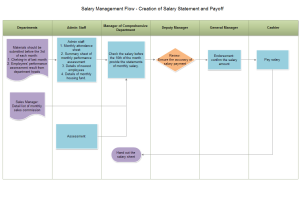 To see more examples, click Flowchart Example Gallery. 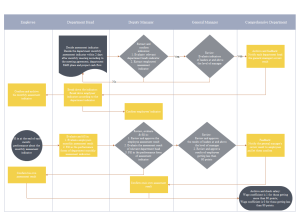 You can use this ready-made template together with extensive cross-functional flowchart symbols in Edraw to make quality cross-functional flowcharts. Click the download links below this picture to save the template. Both PDF and EDDX formats are available. 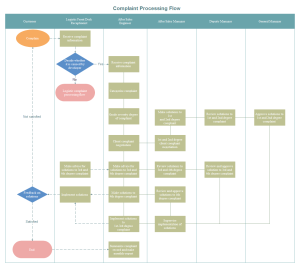 An editable complaint processing flowchart template is well prepared to help with new cross-functional flowchart designs. 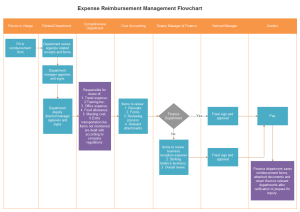 An expense reimbursement management flowchart template is well prepared for our users. Anyone who need a ready made flowchart template can easily download this one and save for future use. 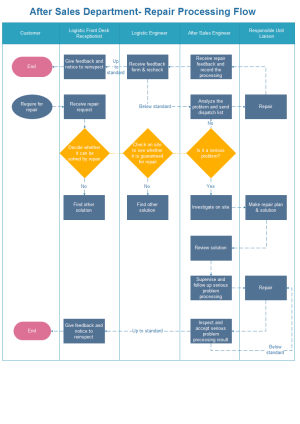 An elaborately designed repair processing flowchart template is provided here, which is available in vector format for anyone to reuse. 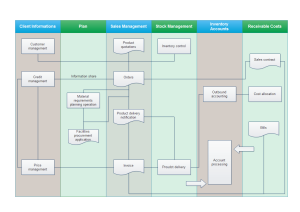 A sales management flowchart template, well-designed and readily available in vector format, is presented here for your use or reference. A purchasing department flowchart template is provided. 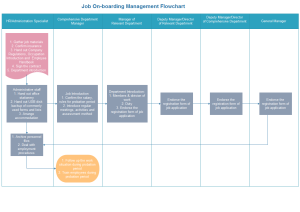 You can take advantage of it to make your own flowcharts in minutes. Anyone who need a cross-functional flowchart template can freely take this one. It's in vector format and easily to redesign and customize for your own needs. 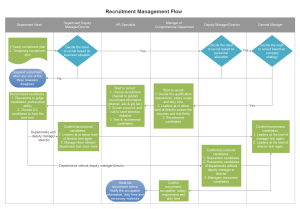 A cross-functional flowchart template is well-prepared and available in vector format. Download and experience the convenience it can bring you. 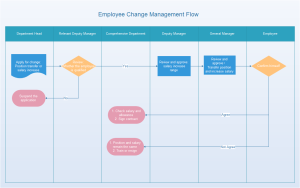 A simple but useful employee change management flowchart template is provided to help users create more professional swimlane flowcharts. 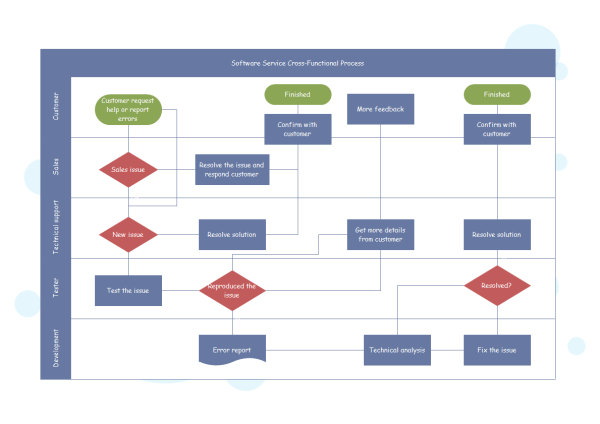 Discover why Edraw is an excellent program to create cross functional flowchart. Try Edraw FREE.